in order to explain some of the background which went into the development of these reports. A recent paper by Anil Sood’s group at MD Anderson in Journal of Cancer: Clinical impact of selective and nonselective beta-blockers on survival in patients with ovarian cancer describes a retrospective pathologic evaluation of ovaries from patients taking various beta blockers for currently approved indications. The history of this finding is quite interesting and, as I remember in a talk given by Dr. Sood in mid-2000’s, a microarray conducted by his lab had showed overexpression of the β2-AR (β2 adrenergic receptor in ovarian cancer cells relative to normal epithelium. At the time it appeared an interesting result however most of the cancer (and ovarian cancer) field were concentrating on the tyrosine kinase signaling pathways as potential therapeutic targets, as much promising translational research in this area was in focus at the time. As a result of this finding and noticing that sustained β-adrenergic stimulation can promote ovarian cancer cell growth (Sood, 2006), Dr. Sood’s group have been studying the effects of β-adrenergic signaling om ovarian cancer. In addition it has been shown that propanalol can block VEGF signaling and norepinephrine increased MMP2 and MMP9 expression, an effect mediated by the β2-AR. Therefore the mainstay therapy is still carboplatin plus a taxane (Taxotere, Abraxane). The results of this clinical trial show a 5 month improvement in survival, which for a deadly disease like ovarian cancer is a significant improvement. First below is a SUMMARY of the paper’s methodology and findings. Several β adrenergic receptor polymorphisms may exist and no downstream biomarker evaluated to determine effect on signaling; could it be a noncanonical effect? The goal of this brief, added curation is to paint a historical picture, and highlight the scientific findings which led up to the rationale behind this clinical trial. Role of mitogen-activated protein kinase/extracellular signal-regulated kinase cascade in gonadotropin-releasing hormone-induced growth inhibition of a human ovarian cancer cell line. Kimura A, Ohmichi M, Kurachi H, Ikegami H, Hayakawa J, Tasaka K, Kanda Y, Nishio Y, Jikihara H, Matsuura N, Murata Y. Cancer Res. 1999 Oct 15;59(20):5133-42. Cyclic AMP induces integrin-mediated cell adhesion through Epac and Rap1 upon stimulation of the beta 2-adrenergic receptor. Rangarajan S, Enserink JM, Kuiperij HB, de Rooij J, Price LS, Schwede F, Bos JL. J Cell Biol. 2003 Feb 17;160(4):487-93. Epub 2003 Feb 10. VEGF is differentially regulated in multiple myeloma-derived cell lines by norepinephrine. Yang EV, Donovan EL, Benson DM, Glaser R.
Brain Behav Immun. 2008 Mar;22(3):318-23. Epub 2007 Nov 5. The neuroendocrine impact of chronic stress on cancer. Thaker PH, Lutgendorf SK, Sood AK. Cell Cycle. 2007 Feb 15;6(4):430-3. Epub 2007 Feb 9. Review. Surgical stress promotes tumor growth in ovarian carcinoma. Lee JW, Shahzad MM, Lin YG, Armaiz-Pena G, Mangala LS, Han HD, Kim HS, Nam EJ, Jennings NB, Halder J, Nick AM, Stone RL, Lu C, Lutgendorf SK, Cole SW, Lokshin AE, Sood AK. Clin Cancer Res. 2009 Apr 15;15(8):2695-702. doi: 10.1158/1078-0432.CCR-08-2966. Epub 2009 Apr 7. Stress effects on FosB- and interleukin-8 (IL8)-driven ovarian cancer growth and metastasis J Biol Chem. 2010 Nov 12;285(46):35462-70. doi: 10.1074/jbc.M110.109579. Epub 2010 Sep 8. Shahzad MM1, Arevalo JM, Armaiz-Pena GN, Lu C, Stone RL, Moreno-Smith M, Nishimura M, Lee JW, Jennings NB, Bottsford-Miller J, Vivas-Mejia P, Lutgendorf SK, Lopez-Berestein G, Bar-Eli M, Cole SW, Sood AK. A growing number of studies indicate that chronic stress can accelerate tumor growth due to sustained sympathetic nervous system activation. Our recent findings suggest that chronic stress is associated with increased IL8 levels. Here, we examined the molecular and biological significance of IL8 in stress-induced tumor growth. Norepinephrine (NE) treatment of ovarian cancer cells resulted in a 250-300% increase in IL8 protein and 240-320% increase in its mRNA levels. Epinephrine treatment resulted in similar increases. Moreover, NE treatment resulted in a 3.5-4-fold increase in IL8 promoter activity. These effects were blocked by propranolol. Promoter deletion analyses suggested that AP1 transcription factors might mediate catecholamine-stimulated up-regulation of IL8. siRNA inhibition studies identified FosB as the pivotal component responsible for IL8 regulation by NE. In vivo chronic stress resulted in increased tumor growth (by 221 and 235%; p < 0.01) in orthotopic xenograft models involving SKOV3ip1 and HeyA8 ovarian carcinoma cells. This enhanced tumor growth was completely blocked by IL8 or FosB gene silencing using 1,2-dioleoyl-sn-glycero-3-phosphatidylcholine nanoliposomes. IL8 and FosB silencing reduced microvessel density (based on CD31 staining) by 2.5- and 3.5-fold, respectively (p < 0.001). Our findings indicate that neurobehavioral stress leads to FosB-driven increases in IL8, which is associated with increased tumor growth and metastases. These findings may have implications for ovarian cancer management. Dopamine blocks stress-mediated ovarian carcinoma growth. Moreno-Smith M, Lu C, Shahzad MM, Pena GN, Allen JK, Stone RL, Mangala LS, Han HD, Kim HS, Farley D, Berestein GL, Cole SW, Lutgendorf SK, Sood AK. Clin Cancer Res. 2011 Jun 1;17(11):3649-59. doi: 10.1158/1078-0432.CCR-10-2441. Epub 2011 Apr 29. Nagaraja AS, Dorniak PL, Sadaoui NC, Kang Y, Lin T, Armaiz-Pena G, Wu SY, Rupaimoole R, Allen JK, Gharpure KM, Pradeep S, Zand B, Previs RA, Hansen JM, Ivan C, Rodriguez-Aguayo C, Yang P, Lopez-Berestein G, Lutgendorf SK, Cole SW, Sood AK. The antihypertension drug doxazosin suppresses JAK/STATs phosphorylation and enhances the effects of IFN-α/γ-induced apoptosis. Park MS, Kim BR, Kang S, Kim DY, Rho SB. hTERT mediates norepinephrine-induced Slug expression and ovarian cancer aggressiveness. Choi MJ, Cho KH, Lee S, Bae YJ, Jeong KJ, Rha SY, Choi EJ, Park JH, Kim JM, Lee JS, Mills GB, Lee HY. Oncogene. 2015 Jun;34(26):3402-12. doi: 10.1038/onc.2014.270. Epub 2014 Aug 25. The antihypertension drug doxazosin inhibits tumor growth and angiogenesis by decreasing VEGFR-2/Akt/mTOR signaling and VEGF and HIF-1α expression. Park MS, Kim BR, Dong SM, Lee SH, Kim DY, Rho SB. Anil K. Sood, Departments of Gynecologic Oncology and Cancer Biology, The University of Texas M. D. Anderson Cancer Center, 1155 Herman Pressler, CPB6.3244, Unit 1362, Houston, TX 77230-1439. Phone: 713-745-5266; Fax: 713-792-7586; E-mail: asood@mdanderson.org. Objective: Stress hormones such as catecholamines can augment tumor metastasis and angiogenesis; however, the prevalence and clinical significance of adrenergic receptors in human ovarian cancer is unknown and is the focus of the current study. Methods: After IRB approval, paraffin-embedded samples from 137 patients with invasive epithelial ovarian carcinoma were examined for \#946;1- and \#946;2-adrenergic receptor (ADRB1 and ADRB2, respectively) expression. Correlations with clinical outcomes were determined using parametric and non-parametric tests. Survival analyses were performed using the Kaplan-Meier method. Expression of ADRB1 and -2 was examined by quantitative RT-PCR in 15 freshly extracted human ovarian carcinoma cells. Human ovarian carcinoma cells then underwent time-variable adrenergic stimulation, and tumorigenic and angiogenic cytokine levels were examined by ELISA. Results: Sixty-six percent of the tumors had high expression of ADRB1; 80% of specimens highly expressed ADRB2. Univariate analyses demonstrated that high ADRB1 expression was associated with serous histology (p=0.03) and the presence of ascites (p=0.03), while high expression of ADRB2 was associated with advanced stage (p=0.008). Moreover, high ADRB2 expression was associated with the lower overall survival (2.2 vs. 6.5 years; p<0.001). In multivariate analysis, controlling for FIGO stage, grade, cytoreduction, age, and ADRB expression, only FIGO stage, cytoreduction status, age, and ADRB status retained statistical significance in predicting overall survival. In tumor cells freshly isolated from human ovarian cancers, 75% of samples had high expression of ADRB2 while most lacked ADRB1 compared to normal surface epithelium. Stimulation of the freshly isolated ADRB2-positive human ovarian cancer cells with norepinephrine resulted in increased levels of cAMP and increased angiogenic cytokines IL-6 and VEGF. Conclusions: ADRB2 are frequently found on human ovarian tumors and are strongly associated with poor clinical outcome. These findings support a direct mechanism by which stress hormones modulate ovarian cancer growth and metastasis as well as provide a basis for therapeutic targeting. Purpose: Catecholamine mediated stress effects are known to induce production of various pro-inflammatory cytokines. However, the mechanism and functional effect of adrenergic signaling in driving inflammation via pro-inflammatory metabolites is currently unknown. Here we address the functional and biological consequences of adrenergic-induced Cox2/PGE2 axis activation in ovarian cancer metastasis. Methods: We first analyzed global metabolic changes in tumors isolated from patients with known Center for Epidemiologic Studies Depression Scale (CES-D; depressive) scores and tumoral norepinephrine (NE) levels. Beta-adrenergic receptor (ADRB) positive cells (Skov3 and HeyA8) were used to study gene and protein levels of PTGS2 (cyclooxygenase2), PTGES (prostaglandin E synthase) and metabolite PGE2 in vitro and in vivo. To study tumor-specific effects on catecholamine-derived expression of PTGS2, we used a novel DOPC delivery system of PTGS2 siRNA. Results: Our results revealed that levels of PGs were significantly increased in patients with high depressive scores (>16). PGE2 was upregulated by 2.38 fold when compared to the low CES-D scores. A similar trend was also observed with other pro-inflammatory eicosanoids, such as 6-keto prostaglandin F1 Alpha (2.03), prostaglandin A2 (1.39) and prostaglandin E1 (1.39). Exposure to NE resulted in increased PTGS2 and PTGES (prostaglandin E2 synthase) gene expression and protein levels in Skov3 and HeyA8. PGE2 ELISA confirmed that upon treatment with NE, PGE2 levels were increased in conditioned medium from Skov3 and HeyA8 cells. Treatment with a broad ADRB agonist (isoproterenol) or ADRB2 specific agonist (terbutaline) led to increases in expression of PTGS2 and PTGES as well as PGE2 levels in supernatant. Conversely, treatment with a broad antagonist (propranolol) or an ADRB2 specific antagonist (butoxamine) in the presence of NE abrogated gene expression changes of PTGS2 and PTGES. ChIP analysis showed enrichment of Nf-kB binding to the promoter region of PTGS2 and PTGES by 2.4 and 4.0 fold respectively when Skov3ip1 cells were treated with NE. Silencing PTGS2 resulted in significantly decreased migration (40%) and invasion (25%) of Skov3 cells in the presence of NE. Importantly, in the Skov3-ip1 restraint stress orthotopic model, silencing PTGS2 abrogated stress mediated effects and decreased tumor burden by 70% compared to control siRNA with restraint stress. Conclusion Increased adrenergic stimulation results in a pro-inflammatory milieu mediated by prostaglandins that drives tumor progression and metastasis in ovarian cancer. 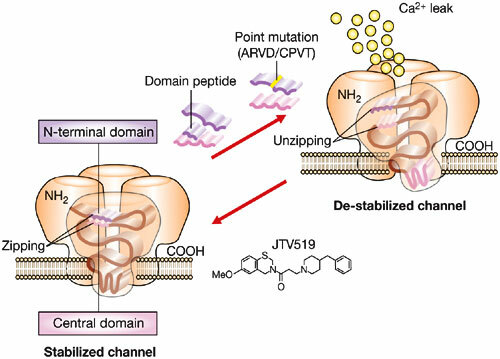 AP, action potential; ARVD2, arrhythmogenic right ventricular cardiomyopathy type 2; CaMKII, Ca2+/calmodulim-dependent protein kinase II; CICR, Ca2+ induced Ca2+ release;CM, calmodulin; CPVT, catecholaminergic polymorphic ventricular tachycardia; ECC, excitation–contraction coupling; FKBP12/12.6, FK506 binding protein; HF, heart failure; LCC, L-type Ca2+ channel; P-1 or P-2, phosphatase inhibitor type-1 or type-2; PKA, protein kinase A; PLB, phosphoplamban; PP1, protein phosphatase 1; PP2A, protein phosphatase 2A; RyR1/2, ryanodine receptor type-1/type-2; SCD, sudden cardiac death; SERCA, sarcoplasmic reticulum Ca2+ ATPase; SL, sarcolemma; SR, sarcoplasmic reticulum. 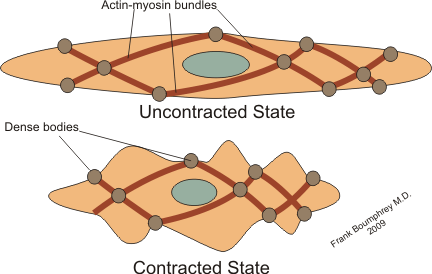 This is Part V of a series on the cytoskeleton and structural shared thematics in cellular movement and cellular dynamics. In the first part, we discussed common MOTIFs across cell-types that are essential for cell division, embryogenesis, cancer metastasis, osteogenesis, musculoskeletal function, vascular compliance, and cardiac contractility. This second article concentrates on specific functionalities for cardiac contractility based on Ca++ signaling in excitation-contraction coupling. The modifications discussed apply specifically to cardiac muscle and not to skeletal muscle. Considering the observations described might raise additional questions specifically address to the unique requirements of smooth muscle, abundant in the GI tract and responsible for motility in organ function, and in blood vessel compliance or rigidity. Due to the distinctly different aspects of the cardiac contractility and contraction force, and the interactions with potential pharmaceutical targets, there are two separate articles on calcium signaling and cardiac arrhythmias or heart failure (Part 2 and Part 3). Part 2 focuses on the RYANODINE role in cardiac Ca(2+) signaling and its effect in heart failure. Part 3 takes up other aspects of heart failure and calcium signaling with respect to phosporylation/dephosphorylation. I add a single review and classification of genetic cardiac disorders of the same cardiac Ca(2+) signaling and the initiation and force of contraction. Keep in mind that the heart is a syncytium, and this makes a huge difference compared with skeletal muscle dynamics. In Part 1 there was some discussion of the importance of Ca2+ signaling on innate immune system, and the immunology will be further expanded in a fourth of the series. which reflects an increased turnover of elementary steps of the calcium ATPase reaction sequence. can dephosphorylate both the CAMP-dependent and the calcium calmodulin-dependent sites on phospholamban. Thus, the calcium pump in cardiac sarcoplasmic reticulum appears to be under reversible regulation mediated by protein kinases and protein phosphatases. essentially reversed the inhibition of the channel by high cytosolic Ca(2+). Potentiation of Po by increased luminal Ca(2+) occurred irrespective of whether the electrochemical gradient for Ca(2+) supported a cytosolic-to-luminal or a luminal-to-cytosolic flow of Ca(2+) through the channel. These results rule out the possibility that under our experimental conditions, luminal Ca(2+) acts by interacting with the cytosolic activation site of the channel and suggest that the effects of luminal Ca2+ are mediated by distinct Ca(2+)-sensitive site(s) at the luminal face of the channel or associated protein. abnormal protein kinase and phosphatase activities have been implicated in heart failure. the effects of protein phosphatases PP1 and PP2A on spontaneous Ca(2+) sparks and SR Ca(2+) load in myocytes permeabilized with saponin. leading to depleted SR Ca(2+) stores in cardiac myocytes. 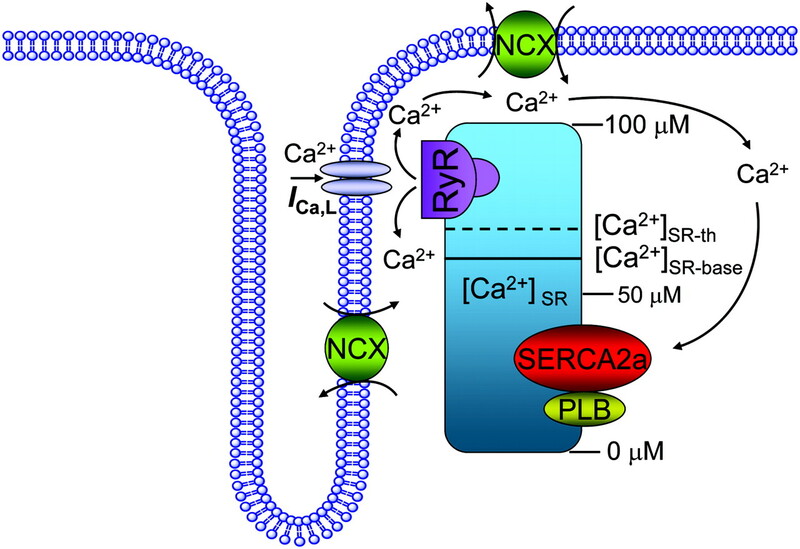 activating Ca(2+) release channels (ryanodine receptors, RyRs) in the sarcoplasmic reticulum (SR). the amount of Ca(2+) stored in the SR.
rendering the channel excessively leaky for Ca(2+) (Marx et al. 2000). leading to depletion of SR Ca(2+) stores. These results provide novel insights into the mechanisms and potential role of protein phosphorylation/dephosphorylation in regulation of Ca(2+) signaling in normal and diseased hearts. Effects of PP1 and PP2A on Ca2+ sparks and SR Ca(2+) content. all these parameters were significantly suppressed by PP1. and suppressed the same parameters at 5 min of exposure to the enzyme (Table 1). PP1 decreased RyR phosphorylation in cardiac myocytes. Figure 1. Effects of PP1 on properties of Ca(2+) sparks and SR Ca(2+) content in rat permeabilized myocytes see . http://dx.doi.org/10.1113/jphysiol.2003.046367 A, spontaneous Ca(2+) spark images recorded under reference conditions, and 1 or 5 min after exposure of the cell to 2Uml_1 PP1. Traces below the images are Ca(2+) transients induced by application of 10 mM caffeine immediately following the acquisition of sparks before (3 min) and after (5 min) application of PP1 in the same cell. The Ca(2+) transients were elicited by a whole bath application of 10 mM caffeine. B, averaged spark frequency at early (1 min) and late (5 min) times following the addition of either 0.5 or 2Uml_1 of PP1 to the bathing solution. C, averaged SR Ca(2+) content for 0.5 or 2Uml_1 of PP1 measured before and 5 min after exposure to the enzyme. Data are presented as means ± S.E.M. of 6 experiments in different cells. Figure 2. Effects of PP2A on properties of Ca2+ sparks and SR Ca2+ content in rat permeabilized myocytes see . http://dx.doi.org/10.1113/jphysiol.2003.046367 A, spontaneous Ca(2+) spark images recorded under reference conditions, and 1 or 5 min after exposure of the cell to 5Uml_1 PP2A. Traces below the images are Ca(2+) transients induced by application of 10 mM caffeine immediately following the acquisition of sparks before (3 min) and after (5 min) application of PP2A in the same cell. B and C, averaged spark frequency (B) and SR Ca(2+) content (C) for the same conditions as in A. Data are presented as means ± S.E.M. of 6 experiments in different cells. 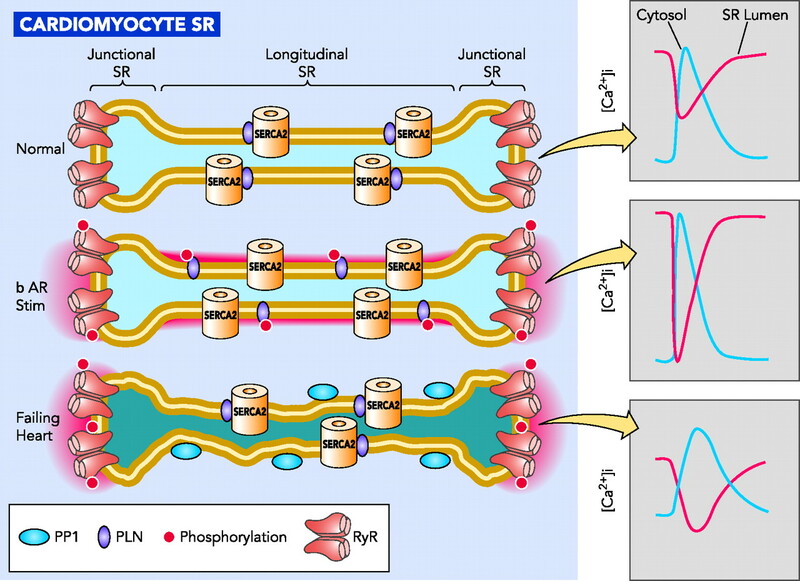 phosphatases stimulated RyR channels lead to depleted SR Ca(2+) stores. modulation of Ca(2+) handling in normal and diseased heart. masks or overcomes the effects phosphorylation may have on RyRs. could explain at least in part why PKA-mediated protein phoshorylation results in maintained potentiation of Ca(2+) sparks despite a potential initial decrease in RyR activity. by making the channel excessively leaky due to dissociation of FKBP12.6 from the channel. dephophosphorylation of RyR rather than its phosphorylation causes depletion of SR Ca(2+) stores by stimulating RyRs in failing hearts. depressed contractile performance and heart failure (Carr et al. 2002). Our finding that PP1 causes depletion of SR Ca(2+) stores by activating RyRs could account for, or contribute to, these results. 1 DelPrincipe F, Egger M, Pignier C & Niggli E (2001). Enhanced E-C coupling efficiency after beta-stimulation of cardiac myocytes. Biophys J 80, 64a. 2 Gyorke I & Gyorke S (1998). Regulation of the cardiac ryanodine receptor channel by luminal Ca2+ involves luminal Ca2+ sensing sites. Biophys J 75, 2801–2810. 3 Gyorke S, Gyorke I, Lukyanenko V, Terentyev D, Viatchenko-Karpinski S & Wiesner TF (2002). 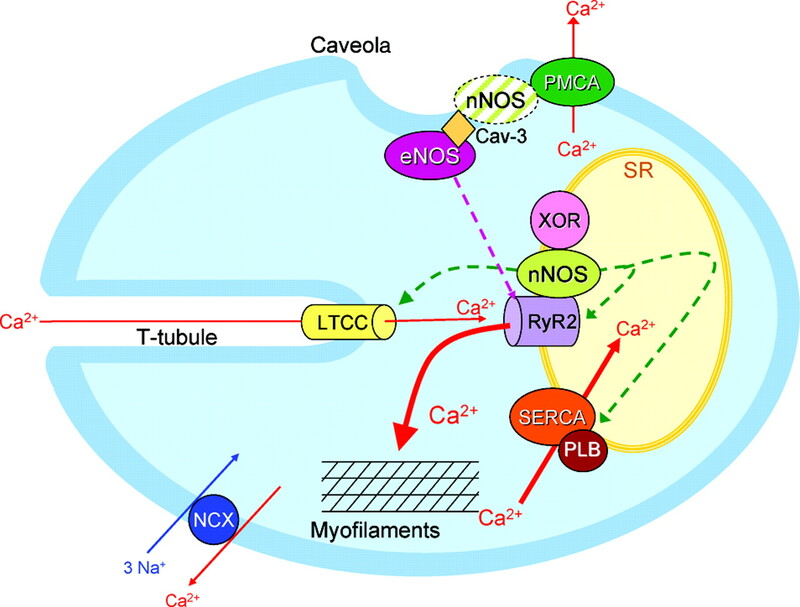 Regulation of sarcoplasmic reticulum calcium release by luminal calcium in cardiac muscle. Front Biosci 7, d1454–d1463. 4 Gyorke I, Lukyanenko V & Gyorke S (1997). Dual effects of tetracaine on spontaneous calcium release in rat ventricular myocytes. J Physiol 500, 297–309. 5 MacDougall LK, Jones LR & Cohen P (1991). Identification of the major protein phosphatases in mammalian cardiac muscle which dephosphorylate phospholamban. Eur J Biochem 196, 725–734. 6 Marx SO, Reiken S, Hisamatsu Y, Jayaraman T, Burkhoff D, Rosemblit N & Marks AR (2000). PKA phosphorylation dissociates FKBP12.6 from the calcium release channel (ryanodine receptor): defective regulation in failing hearts. Cell 101, 365–376. 7 Rodriguez P, Bhogal MS & Colyer J (2003). Stoichiometric phosphorylation of cardiac ryanodine receptor on serine-2809 by calmodulin-dependent kinase II and protein kinase A. J Biol Chem (in press). but also a cytoplasmic isoform, CaMKII δC. its phosphorylation elevated as early as 2 days and continuously for up to 7 days after pressure overload. CaMKII is found associated with the RyR from the CaMKII TG mice. 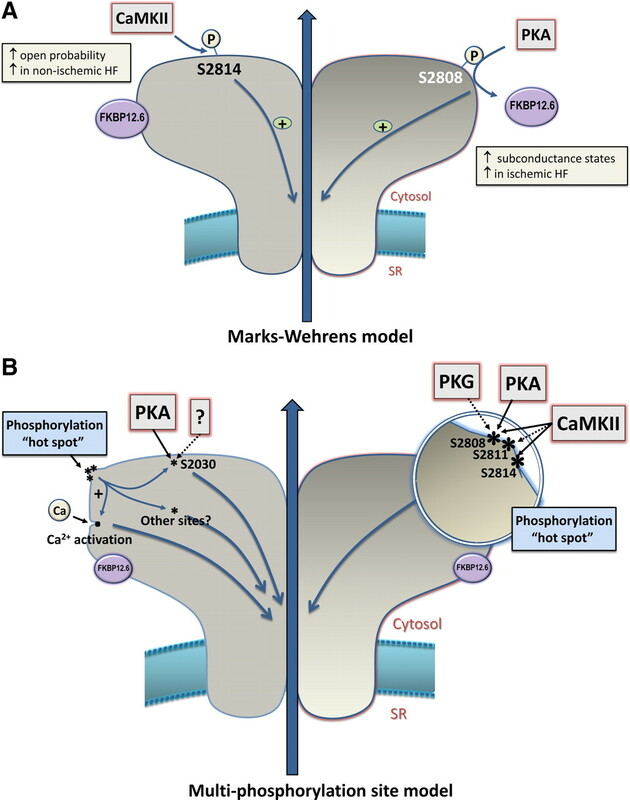 Phosphorylation of phospholamban is increased specifically at the CaMKII but not at the PKA phosphorylation site. mRNA levels for CaMKIIδC were increased 1 to 7 days after TAC (Figure 1B). In addition to examining CaMKII expression, the activation state of CaMKII was monitored by its autophosphorylation, which confers Ca2-independent activity. Figure 1. Expression and activation of CaMKII δC isoform after TAC. see http://dx.doi.org/10.1161/01.RES.0000069686.31472.C5 A, Western blot analysis of total CaMKII in left ventricular (LV) homogenates obtained at indicated times after TAC. Cardiomyocytes transfected with CaMKIIδB and δC (right) served as positive controls and molecular markers. Top band (58 kDa) represents CaMKIIδB plus δ9, and the bottom band (56 kDa) corresponds to CaMKIIδC. *P0.05 vs control. B, Semiquantitative RT-PCR using primers specific for CaMKIIδC isoform (24 cycles) and GAPDH (19 cycles) using total RNA isolated from the same LV samples. C, Western blot analysis of phospho-CaMKII in LV homogenates obtained at various times after TAC. Three bands seen for each sample represent CaMKIIγ subunit (uppermost), CaMKIIδB plus δ9 (58 kDa), and CaMKIIδC (56 kDa). Quantitation is based on the sum of all of the bands. *P0.05 vs control. Figure 2. Expression and activation of CaMKII in CaMKIIδC transgenic mice. see http://dx.doi.org/10.1161/01.RES.0000069686.31472.C5 A, Transgene copy number based on Southern blots using genomic DNA isolated from mouse tails (digested with EcoRI). Probe (a 32P-labeled 1.7-kb EcoRI-SalI -MHC fragment) was hybridized to a 2.3-kb endogenous fragment (En) and a 3.9-kb transgenic fragment (TG). Transgene copy number was determined from the ratio of the 3.9-kb/2.3-kb multiplied by 2. B, Immunocytochemical staining of ventricular myocytes isolated from WT and CaMKIIδTG mice. Myocytes were cultured on laminin-coated slides overnight. Transgene was detected by indirect immunofluorescence staining using rabbit anti-HA antibody (1:100 dilution) followed by FITC-conjugated goat antirabbit IgG antibody (1:100 dilution). CaMKIIδB localization to the nucleus in CaMKIIδB TG mice (see Reference 32) is shown here for comparative purpose. C, Quantitation of the fold increase in CaMKIIδprotein expression in TGL and TGM lines. Different amounts of ventricular protein (numbers) from WT control, TG () and their littermates () were immunoblotted with an anti-CaMKIIδ antibody. Standard curve from the WT control was used to calculate fold increases in protein expression in TGL and TGM lines. D, Phosphorylated CaMKII in ventricular homogenates was measured by Western blot analysis (n5 for each group). **P0.01 vs WT. the extent of increase in active CaMKII in the TG lines was similar to that elicited by TAC. There was significant enlargement of hearts from CaMKIIδC TGM mice by 8 to 10 weeks [see http://dx.doi.org/10.1161/01.RES.0000069686.31472.C5%5D (Figure 3A) and from TGL mice by 12 to 16 weeks. Histological analysis showed ventricular dilation (Figure 3B), cardiomyocyte enlargement (Figure 3C), and mild fibrosis (Figure 3D) in CaMKIIδC TG mice. Quantitative analysis of cardiomyocyte cell volume from 12-week-old TGM mice gave values of 54.7 + 0.1 pL for TGM (n = 96) versus 28.6 + 0.1 pL for WT littermates (n=94; P0.001). Ventricular dilation and cardiac dysfunction developed over time in proportion to the extent of transgene expression. Left ventricular end diastolic diameter (LVEDD) was increased by 35% to 45%, left ventricular posterior wall thickness (LVPW) decreased by 26% to 29% and fractional shortening decreased by 50% to 60% at 8 weeks for TGM and at 16 weeks for TGL. None of these parameters were significantly altered at 4 weeks in TGM or up to 11 weeks in TGL mice, indicating that heart failure had not yet developed. Contractile function was significantly decreased. Figure 6. Dilated cardiomyopathy and dysfunction in CaMKIIδC TG mice at both whole heart and single cell levels. [see Fig 6: http://dx.doi.org/10.1161/01.RES.0000069686.31472.C5] C, Decreased contractile function in ventricular myocytes isolated from 12-week old TGM and WT controls presented as percent change of resting cell length (RCL) stimulated at 0.5 Hz. Representative trace and mean values are shown. *P0.05 vs WT. Figure 7. Phosphorylation of PLB in CaMKIIδC TG mice. [see Fig 7: http://dx.doi.org/10.1161/01.RES.0000069686.31472.C5] Thr17 and Ser16 phosphorylated PLB was measured by Western blots using specific anti-phospho antibodies. Ventricular homogenates were from 12- to 14-week-old WT and TGM mice (A) or 4 to 5-week-old WT and TGM mice (B). Data were normalized to total PLB examined by Western blots (data not shown here). n = 6 to 8 mice per group; *P0.05 vs WT. the increase in RyR2 phosphorylation, which precedes development of failure in the 4- to 5-week-old CaMKIIδC TG hearts, can be attributed to the increased activity of CaMKII. However, the CaMK genes expressed in these mice are neither the endogenous isoforms of the enzyme nor the isoforms likely to regulate cytoplasmic Ca(2+) handling, because they localize to the nucleus. the cytoplasmic cardiac isoform of CaMKII is upregulated at the expression level and is in the active state (based on autophosphorylation) after pressure overload induced by TAC. two cytoplasmic CaMKII substrates (PLB and RyR) are phosphorylated in vivo when CaMKII is overexpressed and its activity increased to an extent seen under pathophysiological conditions. CaMKIIδ is found to associate physically with the RyR in the heart. heart failure can result from activation of the cytoplasmic form of CaMKII and this may be due to altered Ca(2+) handling. activation of both CaMKIIδB and CaMKIIδC, as indexed by autophosphorylation, increases as early as 2 days after TAC. The increased expression, as well as activation of the CaMKIIδC isoform, suggests that it could also play a critical role in both the acute and longer responses to pressure overload. CaMKIIδC plays an important role in the pathogenesis of dilated cardiomyopathy and heart failure. These results have major implications for considering CaMKII and its isoforms in exploring new treatment strategies for heart failure. A strong-weak-strong-weak oscillation in contrac­tion implies that the Ca transient (CaT) is alternating. Until 1999 it was assumed that if the APD is alternat­ing then the CaT alternates because the CaT follows APD changes. However, Chudin et al showed that CaT can alternate even when APD is kept constant during pacing with a periodic AP clamp waveform.14 This implies that the intracellular Ca cycling has intrinsic nonlinear dynamics. A critical component in this process is the sarcoplasmic reticulum (SR), a subcellular organelle that stores Ca inside the cell. 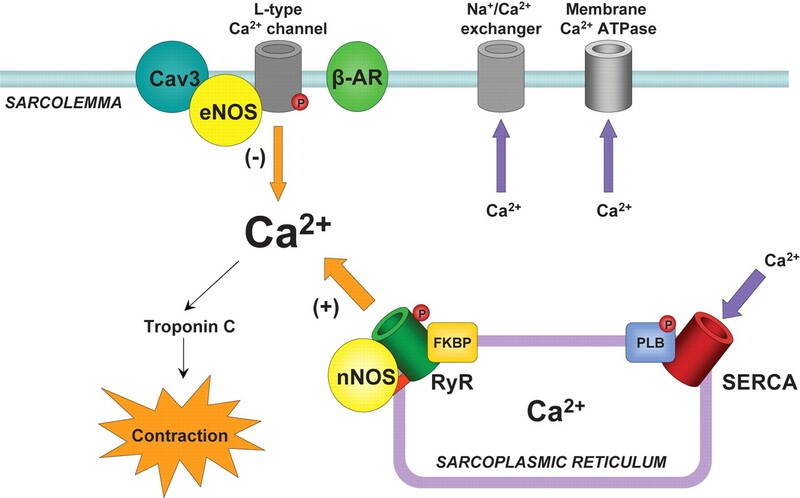 When Ca enters a cell through the L-type Ca channel (or reverse mode Na-Ca exchanger (NCX) ryanodine receptors open and large Ca releases occur from the SR (Ca induced Ca release). The amount of Ca release steeply depends on SR Ca load. This steep relation between Ca release and SR Ca load is the key to induce CaT alternans. A one-dimensional map between Ca release and SR calcium load can be constructed to describe the relationship21 similar to the map used in APD restitution. A number of experimental and computational stud­ies have been undertaken to identify molecular mechanisms of CaT alternans by identifying the specific components in the calcium cycling process critical to formation of CaT alternans. These compo­nents include SR Ca leak and load, Ca spark frequency and amplitude, and rate of SR refilling. For example, experiments have shown that alternation in diastolic SR Ca is not required for CaT alternans.24 In addition, stochastic openings of ryanodine receptors (RyR) lead to Ca sparks that occur randomly, not in an alternating sequence that would be expected to underlie Ca altern-ans. So, how do local random sparks and constant dia­stolic SR calcium load lead to global CaT alternans? Mathematical models with detailed representations of subcellular Ca cycling have been developed in order to elucidate the underlying mechanisms. Model­ing studies have shown that even when SR Ca load is not changing, RyRs, which are analogous to ICaL in APD alternans, recover gradually from refractoriness. As RyR availability increases (for example during a long diastolic interval) a single Ca spark from a RyR will be larger in amplitude and recruit neighboring Ca release units to generate more sparks. The large resultant CaT causes depletion of the SR and when complete recovery of RyRs does not occur prior to the arrival of the next stimulus, the subsequent CaT will be small. This process results in an alternans of CaT amplitude from beat-to-beat. 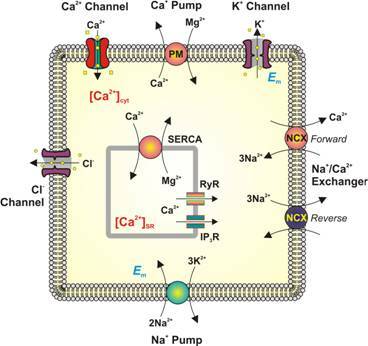 Importantly, the membrane voltage and intracellu­lar Ca cycling are coupled via Ca sensitive channels such as the L-type Ca channel and the sodium-calcium exchanger (NCX). The membrane voltage dynamics and the intracellular Ca dynamics are bi-directionally coupled. One direction is from voltage to Ca. As the DI becomes longer, the CaT usually becomes larger since the recovery time for the L-type Ca channel in increased and the SR Ca release becomes larger. The other direction is from Ca to voltage. Here we consider two major currents, NCX and ICaL. As the CaT becomes larger, forward mode NCX becomes larger and pro­longs APD. On the other hand, as the CaT becomes larger, ICaL becomes smaller due to Ca-induced inacti­vation, and thus, larger CaT shortens the APD. There­fore, depending on which current dominates, larger CaT can prolong or shorten APD. If a larger CaT pro­longs (shortens) the APD, then the coupling is positive (negative). 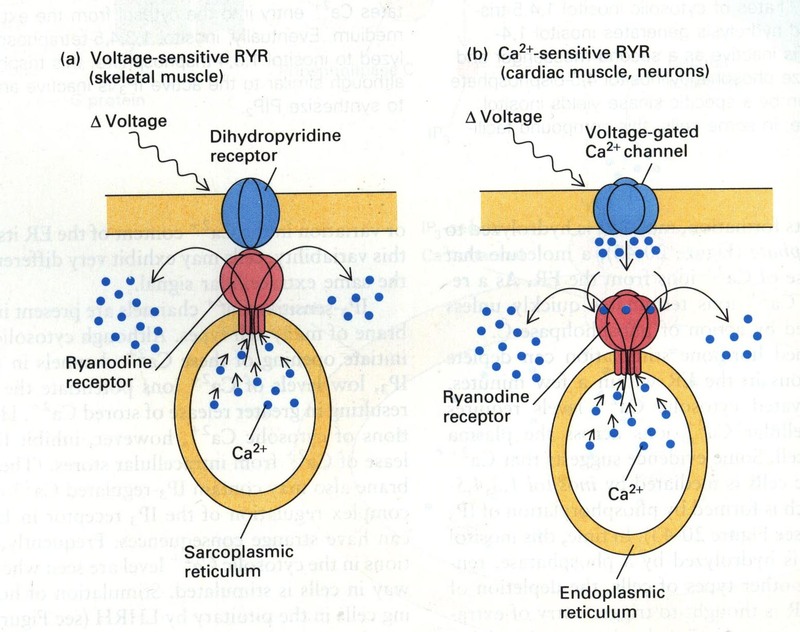 The coupled dynamics of the membrane voltage and the intracellular Ca cycling can be cate­gorized by the instability of membrane voltage (steep APD restitution), instability of the intracellular Ca cycling (steep relation between Ca release versus SR Ca load), and the coupling (positive or negative). If the coupling is positive, alternans is electromechani­cally concordant (long-short-long-short APD cor­responds to large-small-large-small CaT sequence) regardless of the underlying instability mechanism. On the other hand, if the coupling is negative, alternans is electromechanically concordant in a voltage-driven regime. However, if alternans is Ca driven, alternans becomes electromechanically discordant (long-short-long-short APD corresponds to small-large-small-large CaT sequence). It is also possible to induce quasi- periodic oscillation of APD and CaT when volt­age and Ca instabilities contribute equally. Tissue level alternans in APD and CaT also occur and here we describe how the dynamical mechanism of alternans at the single cell level determines the phenomena in tissue. Spatially discordant alternans (SDA) where APDs in different regions of tissue alternate out-of-phase, is more arrhythmogenic since it causes large gradients of refractoriness and wave-break, which can initiate ventricular tachycardia and ventricular fibrillation. How is SDA induced? As the APD is a function of the previous DI, con­duction velocity (CV) is also function of the previ­ous DI (CV restitution) since the action potential propagation speed depends on the availability of the sodium channel. As the DI becomes shorter, sodium channels have less time to recover. Therefore, in general, as the DI becomes shorter, the CV becomes slower. When tissue is paced rapidly, action poten­tials propagate slowly near the stimulus, and thenac-celerate downstream as the DI becomes longer. This causes heterogeneity in APD (APD is shorter near the stimulus). During the following tissue excitation, APD becomes longer and the CV becomes faster at the pacing site then gradually APD becomes shorter and the CV becomes slower. The interaction between steep APD restitution and steep CV restitution creates SDA. This mechanism applies only when the cel­lular instability is voltage driven. When the cellular instability is Ca driven, the mechanism of SDA formation is different. If the volt­age-Ca coupling is negative, SDA can form without steep APD and CV restitution. The mechanism can be understood as follows. First, when cells are uncou­pled, alternans of APD and Ca are electromechanically discordant. If two cells are alternating in opposite phases, once these cells are coupled by voltage, due to electrotonic coupling, the membrane voltage of both cells is synchronized and thus APD becomes the same. This synchronization of APD amplifies the difference of CaT between two cells (Fig. 5 in). In other words it desynchronizes CaT. This instability mechanism is also found in subcellular SDA. In the case where the instability is Ca driven and the coupling is positive, there are several interest­ing distinctive phenomena that can occur. First, the profile of SDA of Ca contains a much steeper gra­dient at the node (point in space where no alternans occurs–cells downstream of the node are alternating out of phase with those upstream of the node) com­pared to the case of voltage driven SDA. Thus, the cellular mechanism of instability can be identified by evaluating the steepness of the alternans amplitude gradient in space around the node. When the cellular instability is voltage driven, the steady-state wave­length (separation of nodes in space) depends on electrotonic coupling between cells and the steepness of APD and CV restitution, regardless of the initial conditions. However, if the cellular instability is Ca driven, the location of nodes depends on the pacing history, which includes pacing cycle length and other parameters affected by pacing frequency. In this case, once the node is formed, the location of the node may be fixed, especially when Ca instability is strong. Such an explanation may apply to recent experimen­tal results. Summary In this review, we described how the origin of alternans at the cellular level (voltage driven, Ca drive, coupling between voltage and Ca) affects the formation of spatially discordant alternans at the tissue level. Cardiac alternans is a multi-scale emergent phenomenon. Channel properties determine the instability mechanism at the cellular level. Alternans mechanisms at cellular level determine SDA patterns at the tissue level. In order to understand alternans and develop anti-arrhythmic drug and therapy, multi-scale modeling of the heart is useful, which is increasingly enabled by emerging technologies such as general-purpose computing on graphics processing units (GPGPU) and cloud computing.